In the field of psychology, as with any client-based profession, strong technique and connection to the client are fundamentally important. You will find me to be a dynamic, engaged, compassionate, focused, and attentive therapist. My clients often remark that they easily understand me and relate well to me. I find the clinical work that I do to be very rewarding and inspiring, and that positive energy is infused into my sessions with my clients. My goal is to help you achieve your full potential in living a joyful, purposeful life. Over the last 20 years, I have trusted Dr. Jill Prolman to take good care of my patient’s psychological needs. She is a therapist with outstanding skills – who makes her clients feel at ease while providing practical guidance on how they can improve their lives. Dr. Prolman is able to build a trusting bond which is essential for helping people work through anxiety, depression, relationship issues, and grieving. I highly recommend this competent and compassionate psychologist! There isn’t any professional that I have dealt with in my adult life that I would recommend more highly than Dr. Prolman. She is a gifted therapist who helped me through an unbelievably difficult family crisis with her wisdom, patience, support and her non-judgmental way of giving me the confidence to effectively deal with all the issues involved. Even when my life started to return to normalcy I chose to continue meeting with her as there was so much more I could learn from her about myself and how I interacted in the world. I often think of her fondly when handling everyday life situations and know how much she has impacted my life. She’s the best! I have been referring patients to Dr. Prolman for over 10 years. She is a warm and caring person and she is able to relate to her patients in an everyday manner that her patients find comforting and rewarding. Dr. Prolman has guided many of my patients through the difficult challenges of their lives. My referrals have reported back to me that her time with them was always beneficial and her expertise, compassion, and her ability to relate significantly contributed to their overall health and wellbeing. 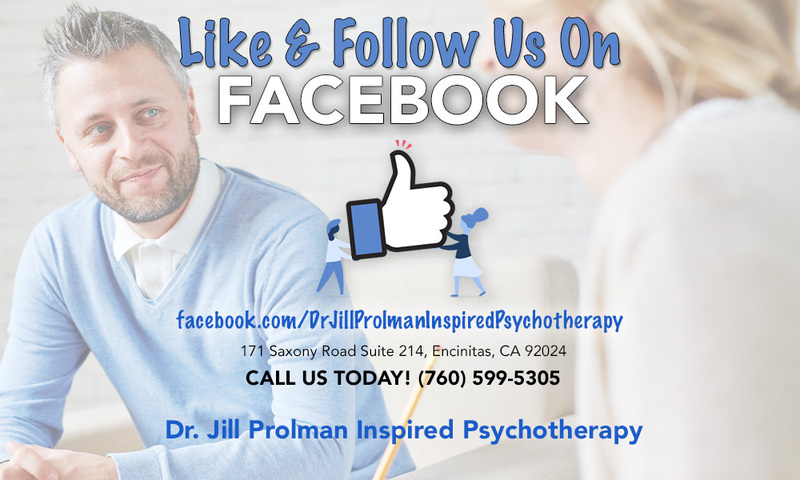 Dr. Jill Prolman has been a great resource for me. She is a great listener. This skill has allowed her to gain a better understanding of whatever issue I have faced and offer guidance how best to address these challenges. Whether it's assistance down the path in life I haven't wanted to take but needed to, or offering reassurance that the path I am currently on is where I need to be, I can always depend on Dr. Prolman to share her wisdom, experience and training with me on how best to deal with any situation in life. I refer to Dr. Prolman as much as possible because she is extremely professional, I always get positive feedback from patients and she does an exceptional job of keeping me updated on the clinical progress they are making. People that I have referred to her are always very happy with her insight and her engaging manner as well as with the assistance with their issues. Life can have its ups and downs as well we all know. I had turned to therapy for a crisis and discovered everyday life became smoother too. I have found Dr. Jill Prolman to be an effective, ethical, gifted therapist. Through her innate compassion and her extensive knowledge of human emotion and behavior, I have been able to acquire the tools and skills to deal more rationally and effectively with my life. This all happens in a safe and confidential manner that I have found to be comforting and motivating.